This is the second in a series of reviews dedicated to the concept of 32Ohm Audio as embodied by the store of that name in downtown Portland/Oregon and described here - Ed. How much for the world's best loudspeakers? Of course there's no agreement on just what the best speaker would be. But, we can agree that it wouldn't be too hard to arrive at an obscene six figures for certain pretenders to the throne. Feeling suddenly nauseated? Remember, there's always an eminence gris behind the throne. That's the real brains. That's who wields true power but is never seen. Perhaps that's because she listens to headphones? How much for the world's best headphones? Most applicants fall below $2,000. Nobody but the jaded would call that cheap. But considering the best money can buy—cutting, bleeding, exhilarating edge of the art—it does put things into perspective. The best remains a moving target and matter of taste and opinion. Perhaps you nominate Audio-Technica's W5000, Stax's top electrostats, Grado's PS1000, Denon's AH-D7000, Beyer's T1, Ultrasone's Edition 8 or these new Sennheisers. Regardless, wallet cramps are suddenly a lot mellower if you wish to dance atop Mt. Gourishankar (we'll leave Everest to loudspeakers and don't tell them it's the same geographical peak). Most audiophiles not into headphones aren't hip to the many choices at the upper-most level of this component category. There are AMT-based units and Raal has even talked of issuing a pair around their celebrated ribbon tweeters. And there are ear canal versions custom-tailored to each owner. The point is, even the very best of headphones remain within reach of a far larger populace than their loudspeaker equivalents. Far more Joes and Jills can drive Ferrari or Porsche instead of Honda. Trading the far larger variable of room acoustics for just the smaller one of individual ear geometries is a further point in their favor. It might surprise you but 3-way headphones do exist. Yet most use just one driver the size of a stamp - er, standard tweeter. Proximity to your aural receptors and the minuscule air volume trapped between artificial and biological diaphragms require no more. After 60 years of operation however, Germany's Sennheiser decided that for their latest and greatest assault at the crown, size did matter (and no, this model is not made in an American plant but the Wedemark headquarters). 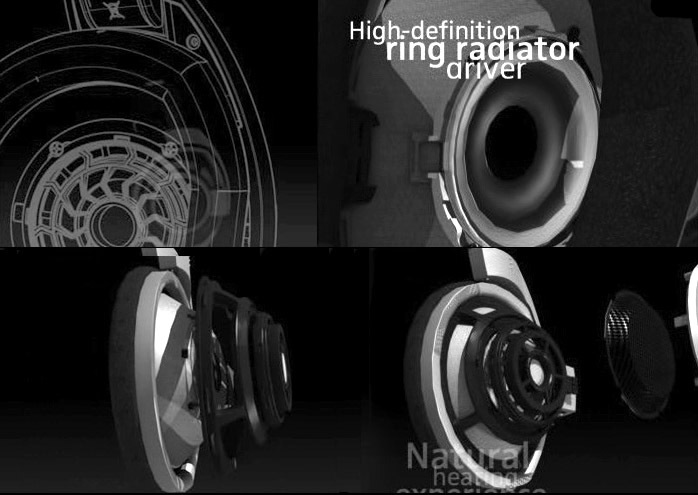 Consequently, the Neodymium-powered two-layer ring radiator inside the HD800—firing at your ear in a strategic angle to simulate free-air sound arrivals—is claimed to sport the largest diameter* ever seen for such applications: 56mm or 2.205" (with a 40mm voice coil). That's twice your average tweeter. 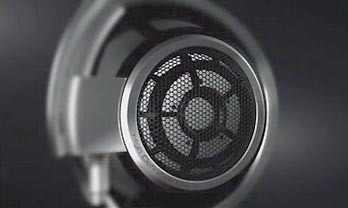 The best of those can cost speaker makers well above $200/ea** for the raw part. Generally you don't encounter them until you shell out about 100 times that for the full speaker. * At 53mm, Audio-Technica's unit inside their ATH-W-5000s isn't much smaller. This obsession with radiating surface explains the hulking dimensions of the open-backed circumaural stainless earpieces which turn the HD800 into one of the largest of their kind. At nearly 12 ounces or 330 grams, they are also on the heavier side. 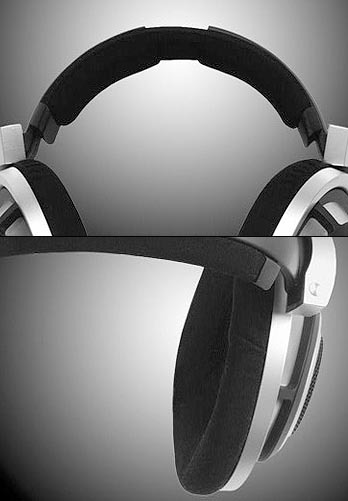 Playing the luxury game further gets you a Leona-laminated/damped steel headband. Alcantara for the ear pads. 3 meters of fabric-sheathed Kevlar-reinforced Teflon-insulated 4-strand straight OFC copper wire in a Y harness. And stout detachable ear-cup terminations. Those now very officially condemn Sennheiser's two-prongers for the previous HD600/650 range toppers as the funky business they were. 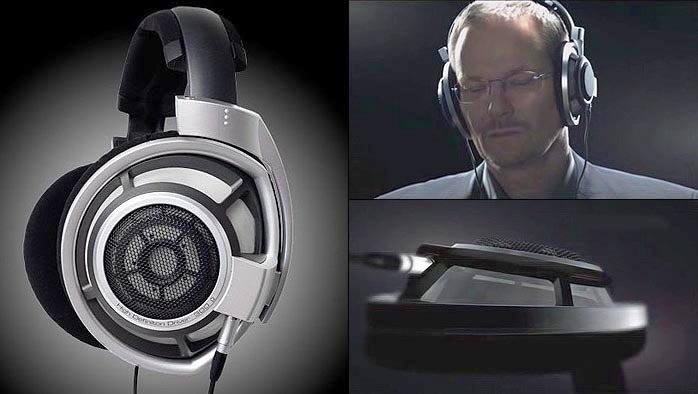 Average 400-ohm impedance puts the HD800s closer to the 600-ohm professional standard than many low-impedance consumer cans. The 102dB sensitivity spec meanwhile sits where most the competing elite plays, certain in-ear models even higher. The upshot is that one of the greats in high-performance consumer headphones has launched a serious challenger at the state of the art. This merely adds pressure on arch rival AKG who need a replacement for their discontinued K-1000. BeyerDynamic has reacted already with their new Tesla 1 introduced at the Berlin IFA show 2009. Does HD in the 800 nomenclature signify high definition, heavy duty, hot dang or all of it? They certainly surround even big ears in comfort. Ultrasone's Edition 8 at the Milan Top Audio show did not. Having owned Sennheiser's HD650 in the past, I'd quickly sold them in favor of the Audio-Technica W1000. I found the 650s uncomfortable. The headband exerted too much pressure on my admittedly big skull and the velour enclosures had my ears sweat in no time. I might have suffered quietly for beauty but sonics were thoroughly bested by the Japanese. This snapped the already tenuous straw. When I recently learned that Jan Meier of Corda headphone amp fame had re-entered headphone sales exclusively for the 800 model and stocked them, I ordered a personal pair.